I just received a delicious vanilla ice-cream affogato (ice-cream with an espresso shot poured on top) from Murphy's ice-cream at Morton's shop on Hatch Street. Mile buíochas! 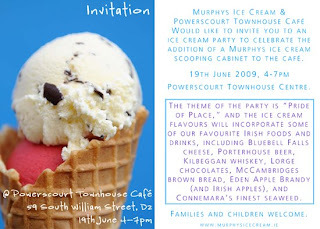 Murphy's delicious Ice Cream will now be available from a scooping cabinet in Powerscourt Town Centre Cafe. To celebrate, they've issued an open invitation to all and sundry to attend the opening on June 19th (today) between 4-7 pm. Families and children are welcome and they are promising flavours of Ireland.